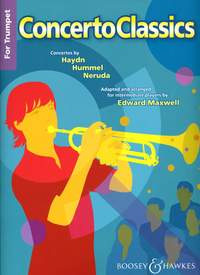 Concerto Classics - Trumpet. Gives intermediate trumpet players the opportunity to explore the most important and influential concertos in the instruments repertoire. Each concerto has been carefully arranged as a valuable stepping-stone towards experiencing the original great works, and gives the students their first taste of a concerto performance. Contains the following three Composers: Haydn, Hummel and Neruda.